The application is being considered under the Marpole Community Plan. 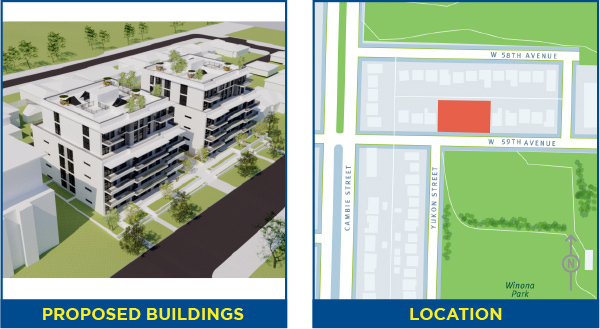 *Please note: the rezoning application indicated a maximum height of 19.97 m (65.4 ft.) and 103 vehicle parking spaces. However, following technical review, the proposed maximum height is actually 21.3 m (70 ft.) and there are 99 vehicle parking spaces. A community open house was held from 5:00 to 7:00 pm on Monday, May 7, 2018 at Peretz Centre, 6184 Ash Street, with the applicant team and City staff available to answer questions.